Breakfast cereal, milk, tea, coffee, shampoo and body wash included! Porta-Cot crib and baby bath available on request. Second floor balcony with table and chairs. Second TV in upstairs bedroom - the one with two single beds. A single foam mattress is available to sleep on the floor. I can supply linen on request for this. Always a pillow and duvet in house. Board games for all the family to enjoy. Located in a modern set of two-level townhouses, this quiet lane backs onto a large park. Bottom floor has a double bedroom, full bathroom, double internal access garage with washing machine and garage clothes line. Clotheshorse also. The downstairs bedroom has a double wardrobe, queen bed and private fenced courtyard out a glass ranch slider, also a full bathroom for you to use in privacy. No running around other people to get to the bathroom! Both bathrooms are spacious and clean with toiletries, bodywash/shampoo, large mirror and own hair dryer. An iron and ironing board is also in the house should you need to use them. Upstairs is two further double sized bedrooms - one with a queen, other has two singles, plus a second full bathroom. We have everything you will need – oven, fridge/freezer, toaster, jug, microwave and dishwasher. I provide coffee, tea, sugar, breakfast cereals, toast in the freezer, among many other condiments, shampoo, conditioner and soap to all guests free of charge. Large dining table, SKY TV and huge comfortable leather lazy boys, two heat pump/air-conditioning units with FREE WIFI. 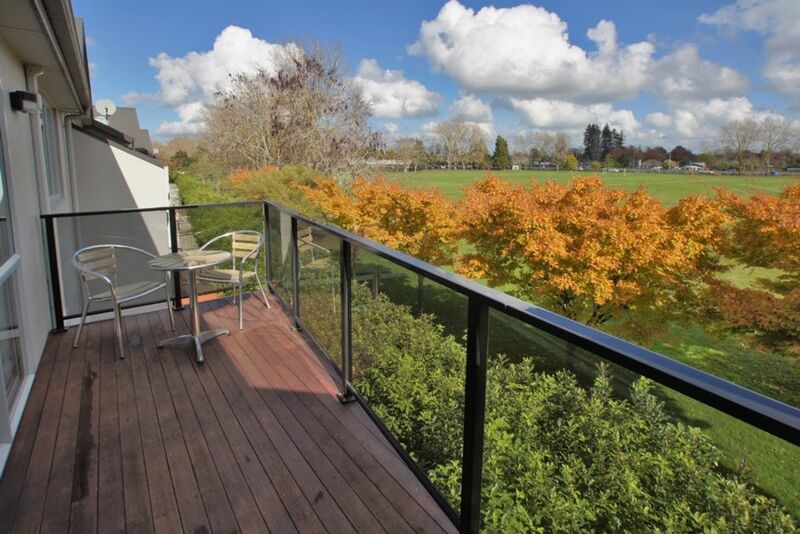 Another big glass ranch slider takes you from the living room out onto a patio/balcony overlooking the neighbouring large park and trees. Very rare to find so close to the city. We are a quiet set of townhouses with respectful neighbours, so no parties please. A fully refundable bond is required to book. Please do not be offended if asked. Advise if you need a portacot and baby bath as I can bring this over for you. Lazy Boys, Free SKY TV and WIFI. Open plan. Two TVs. Two queen and two singles, two bathrooms. House is in a great location. House is in a great location. Close to the city and the Hamilton Gardens, so many food places nearby and a park just adjacent to the property for those wanting a space to exercise. Perfect all around. Absolutely love it!! It is wonderfully presented, with all the mod cons of an upmarket modern apartment. located in a delightfully tranquil setting, it has a peaceful, spacious feel to its location, which is only belied by the ease & speed with which you can leave the sanctuary and be in the city centre in a matter of minutes. With the balcony combining a great view of the park with a surprising privacy, & the downstairs courtyard an outside haven, we had everything we could wish for! Good central location in Hamilton East. Good central location in Hamilton East. Tidy comfortable property.